Today is Palm Sunday. That time of our Church year, when we remember and reflect on Jesus’ arrival in Jerusalem, trying to understand how this event speaks to us today and what it teaches us. Let’s see. This event is called Jesus’ triumphal entrance into Jerusalem. Triumphal… Was it really triumphal? I am not so sure. Perhaps if you looked at it only from the outsider’s perspective. But how would it look from the inside? What do you think, is 30 years a long time? I guess it depends. Not too long when you are the eternal God, who created time and space and everything. But it can be quite long even for the eternal God, if that time is spent in human flesh. And not just somehow spent, but spent waiting for the day when He will accomplish His mission. That is, will suffer and be killed on the cross. Innocent. Sacrificing Himself also for the salvation of those who demanded His death. The entire life of Jesus was leading up towards this one week, towards these few days that He will spend in Jerusalem. To those last few hours that changed the course of our history forever. Jesus had been teaching to those who listened to Him, that He must go to Jerusalem, suffer from the hands of Jewish leaders and be killed. Jesus had been fore-telling it again and again. Even His opponents had heard it well. 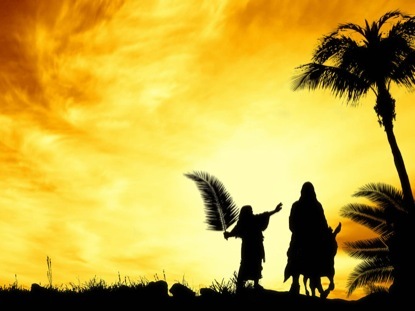 Finally, the time had come, that Palm Sunday, when Jesus was heading to Jerusalem, to fulfill His mission, to suffer and be killed, and to fulfill what the Holy Spirit had revealed through the prophets. Would you describe His arrival as triumphant? We need to refresh what was the context of Jesus’ arrival in Jerusalem. For a while Jesus had been teaching and preaching the Good News about the Kingdom of God, speaking with authority, explaining also why He had come. However, it seems that no one understood Him. At least, not yet. Jesus had also had compassion towards people. So often, contrary to His intentions, and in a way even hindering His main mission, He kept helping people. Jesus had healed many and many. People from everywhere were streaming to Him, bringing to Him their sick and demon possessed. Whenever Jesus looked at them, whenever He saw their desperation and pain, He had compassion and helped them giving Himself fully. As if that wasn’t miraculous enough display of His super-natural power, Jesus also manage to do things which caused people to tremble in fear. Just remember the rebuking the storm, or walking on the water, or raising the dead. Just a little while ago Jesus had raised from the dead His dear friend Lazarus, who happen to live only a short distance from Jerusalem. Many had seen it happening. Many had come to see Lazarus after he was raised, and many had believed that Jesus was someone very special. Even Jewish leaders were well aware of what had happened. No one could deny that this Jesus was acting with an extraordinary power. The expectation of the people kept growing. As a little nation that had lost its freedom, they were longing for the former glory to be restored. They were waiting for the Messiah, the Savior, promised by their God, to come and to deliver them from all their enemies. The time was right. The Scripture told so. And who could be a better candidate than this Jesus? How could Jesus feel amidst of this? Triumphal? I don’t know. How easy is it to be misunderstood? How easy is it to carry your burden alone, when there is no one to share it with? For no one understands, no one can help. Jesus was coming to hand Himself over in the hands of His enemies, to suffer and be killed for the sake of us all. But people who accompanied Him failed to understand it, or even to understand who Jesus was. When asked: “Who is this?” the crowds said: “This is … the prophet Jesus, from Nazareth of Galilee.” Jesus, just a prophet from Galilee. People who cheered for Jesus and shouted out of joy, they were hoping that their powerful super savior has arrived, who would just blast all their enemies away, and would introduce the golden age for their nation. Then everyone would live in prosperity, healthy and well fed, dwelling securely in their land… isn’t that what we all desire? Isn’t that what people often expect from God? Isn’t that what God is supposed to give to all His people? Jesus didn’t come to assume some earthly power and to destroy those who opposed Him. And we, as His body, His Church, who are left to continue Jesus’ mission, we shouldn’t think about the role of the Church as an earthly power. We are not here to gain political influence and to triumph over our enemies. To force them to do what we believe is the right thing. Jesus came to give up His live not only for His friends, for they all had abandoned Him, but also for His enemies, who were present. He didn’t see them as enemies. Not Caiaphas, not Pilate, not the soldiers who beat Him and mocked Him, not those who nailed His hands and feet to the cross. Jesus knew the true enemies, – sin, death and devil. He knew that people were not His enemies. Rather pitiable captives of sin and devil. And He had pity on them. He prayed for everyone. He gave His life for everyone. For those who executed Him. For me. For you. For the person who has hurt you the most. We are His Church, His followers, we too are called to love and to care for all people. We have no enemies whom we need to overpower politically. We have only fellow sinners, for whom we are to pray, so that one day they would become our brothers and sisters in Christ, and fellow-heirs of God’s Kingdom. Jesus hadn’t come to ensure that everyone is healthy and well-fed. Yes, He had compassion on people, He helped them, He even fed them miraculously, but that wasn’t why He came. If anything, these things often hindered people from hearing Jesus’ message and understanding His true mission. We too, as Jesus disciples, we are to care for everyone whom our Father has placed in our lives, in our way. We are to serve them and help them in all their bodily needs. But this is not the main purpose for us as the Church. Jesus came to deliver us from under the power of Satan and to transfer us in His Kingdom. He came to reconcile us with the Father and bring us into His family. He came to conquer our ultimate enemy – death, and give us the most precious gift, eternal life with Him in restored heavens and earth. He did it. And we too are here to continue the work of Jesus. Now He does it through us. He sends us with the Good News, to tell everyone what He has done. And we need to be in awe and amazed by what great a privilege is entrusted to us. As we speak the message from Jesus, as we invite people to return to the true God, our words are not only our words. It is Jesus Himself and the Holy Spirit who accompany us. We can’t deliver anyone from the power of Satan or transfer them into God’s Kingdom. We can’t reconcile anyone with God. We can’t give to anyone eternal life. We don’t have such power. But… and this is the amazing miracle of how Jesus continues to work through us – whenever you witness about Him, whenever you share His message, the Holy Spirit works hard through you to change people’s hearts, to rescue them from their spiritual death, to give them new life, to bring them in God’s family. It is Jesus Himself who speaks through us, His messengers, and He has all the power in heavens and on earth, and His words always accomplish what they are sent to do. This is what we are here to do, to continue Jesus’ rescue mission. Yes, we too are often misunderstood. And it is not wonder that we share the fate and rejection that Jesus did. Too often people think that Christians are just one more group in society who fights for power, for influence, trying to impose on everyone their own ideas. And sadly, but sometimes such critique may be true. Or that we use the concepts of heaven and hell to gain control over peoples’ lives, taking away their freedom and most importantly – their money. And even these accusations sometimes are true. We are often misunderstood. But we are here to offer to the dying and broken, to foolish and arrogant world something unique, something infinitely precious that every human being desperately needs – free gifts of our gracious God. Those gifts that Jesus has brought to us through His death and resurrection – forgiveness and eternal life. We live in this world, but worldly things are not our ultimate concern. Our hope is set on the world to come. On our life with Jesus, in New Heavens and New Earth, where there will be no more sin, or jealousy, or strife, or sufferings, or betrayals, or foolishness, or pride, or crying or death… but where God’s own presence among us will satisfy all our deepest longings. Jesus came to Jerusalem misunderstood, and was rejected. We often are misunderstood and rejected. But we can rejoice and take courage following the example of our Master. We too are called to humble ourselves, to consider others as more significant than ourselves. For Jesus considered you as more important than Him. Not fighting for our rights, but loving and praying even for our enemies. Giving up our lives, so that other may life. Sacrificing ourselves in service to others. Sharing the life-giving Gospel, even if we are hated for Jesus’ name’s sake. Sure, we can’t do it on our own, we can do it only in the power of the One Himself walks with us, speaks to us and through us and gently leads us to be with Him forever. If we can learn anything from what happened on that Palm Sunday it is not to long for this worldly recognition, for it usually comes as the result of misunderstanding. Rather let’s long to be like our Lord, focused on His mission, not swayed by what people think or say, knowing that if by God’s grace we keep following Jesus, we will end up where He is now. And that is more than anyone can hope. That is more than enough. ← “Cultural Christians”? Sounds familiar?